At the core of Community Cloud is the ability for customers, partners, and employees to share information and help each other find answers. So to help you get started, we’ve answered the questions that we hear most often. If you think of any others, please don’t hesitate to contact us — we’re always here to help. Community Cloud is an online social platform that enables companies to connect customers, partners, and employees with each other and the data and records they need to get work done. This next-generation portal combines the real-time collaboration of Chatter with the ability to share any file, data, or record anywhere and on any mobile device. Community Cloud allows you to streamline key business processes and extend them across offices and departments, and outward to customers and partners. So everyone in your business ecosystem can service customers more effectively, close deals faster, and get work done in real time. What can you do with Community Cloud? You can build communities to gain deeper relationships with customers or provide better service by enabling customers to find information and assist each other online. Or you can connect your external channel partners, agents, or brokers to reduce friction and accelerate deals. And you can empower employees to connect and collaborate wherever business takes them. 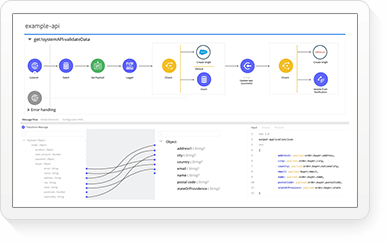 Because Community Cloud is built on the Salesforce platform, you can connect any third party system or data directly into the community. Your organization gains the flexibility to easily create multiple communities for whatever use case your business demands. What are some common ways to use Community Cloud for employees? HR and IT Help Desk can engage employees and deliver critical knowledge and instructions. And from onboarding to payroll to IT troubleshooting, employees can help themselves to the information they need, 24/7. Employees find, share, and collaborate on content in real time, and connect with others in the social intranet — beyond the boundaries of their department, office, or even country. What are some common ways to use Community Cloud for customers? 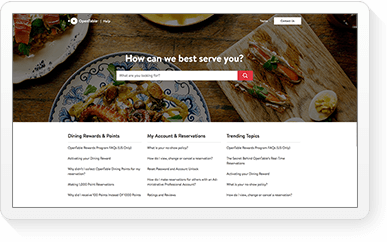 Self-service empowers customers to find answers to their questions with a searchable knowledge base, and work together to answer one another’s questions and solve problems, dramatically reducing service cases while increasing customer satisfaction. Community engagement leverages passionate consumers as “experts” within the community to be rewarded for helping other customers. 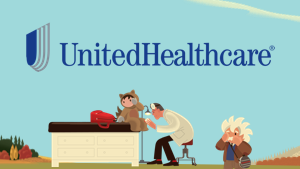 These evangelists help lend a human face to your brand — and promote deeper customer loyalty. Empowered e-commerce enables customers to track their accounts, and connect to other customers to share experiences with the product, add reviews, and even suggest product improvements. What are some common ways to use Community Cloud for partners? 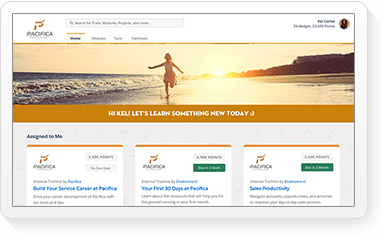 A partner knowledge portal allows you to give your entire channel immediate access to the resources and experts they need, such as critical sales assets and product information, and even provide training and certification courses to keep your sales organization running smoothly. 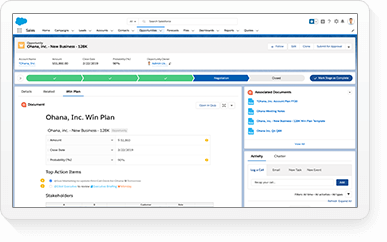 A channel sales community connects your internal and external sales teams in real time, so partners can collaborate directly on sales records, easily track revenue, monitor pipe generation to reduce deal friction — and make deals happen. How secure is Community Cloud? Community Cloud is built on the trusted Salesforce platform. The robust and flexible security architecture of the platform is relied on by companies around the world, including those in the most heavily regulated industries — from financial services to healthcare to government. It provides the highest level of security and control over everything from user and client authentication through administrative permissions to the data access and sharing model. Trust starts with transparency. 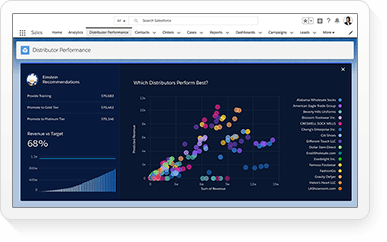 Salesforce displays real-time information on system performance and security, and offers tips on best security practices for your organization. Do I need to be a big business to take advantage of Community Cloud? Companies of any size can create seamless, branded community experiences quickly and easily with Community Cloud. For example, Lightning Community Builder and Templates provide a great out-of-the-box solution to get you started, with simple customization options as your business grows. Lightning Community Builder makes it easy to customize your mobile-optimized community to perfectly match your brand. This includes incorporating third-party and custom components for ultimate customization. Community Templates are secure, reliable, scalable, and optimized for mobile. These state-of-the-art templates are designed to be used right out of the box — no coding or IT required. How is Chatter different from Community Cloud? Chatter is the social layer that goes across all Salesforce’s products. A company can also use Chatter to create an internal social network across their organization. Chatter provides a forum that allows anyone to share insights, propose ideas, connect teams, and provide direct feedback instantly. Community Cloud allows companies to create branded sites that connect customers, partners, and employees with experts and information — and each other. 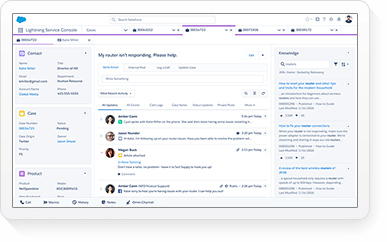 As with other Salesforce products, Chatter is the social layer in each community, which can be enabled to enhance personal interaction and direct collaboration among members. What are my mobile options with Community Cloud? There are many options for using Community Cloud on a mobile device. Because Community Templates are fully responsive, it’s easy to provide a rich experience that can be viewed on any mobile device. For employee communities, your workforce has full access to Salesforce. And customers also can create a customized mobile app for their community using the Salesforce Mobile SDK, which is now available to all Force.com and Database.com developers. What if I’m a Portals customer? If you already have a customer or partner portal, you’re automatically a Community Cloud customer. You simply need to migrate your portal to create a community. Migration is easy. Because Community Cloud is our next-generation portal, it offers all the functionality available in portals, plus many additional features. Community Cloud gives your business the power of a social platform. It allows you to streamline business processes by sharing data and files to the internal and external users you choose — and allows them to collaborate in real time, from anywhere. Files Connect integrates third-party file repositories with Salesforce to make them instantly mobile and social. Files Connect users can immediately connect Microsoft SharePoint, Microsoft OneDrive, or Google Drive files to Salesforce — and access them from their desktop or Salesforce. It’s easy to attach files to Salesforce records and share them with the audiences in your community directly from the feed, making critical documents instantly available for customers, partners, and employees. So everyone can connect and collaborate on any device, from anywhere. If I’m a Community Manager, how easy is it to run my community on Salesforce? Our Community Management Console allows you to quickly and easily monitor and measure key metrics, run reports, set up customized dashboards, and take action from one central place. 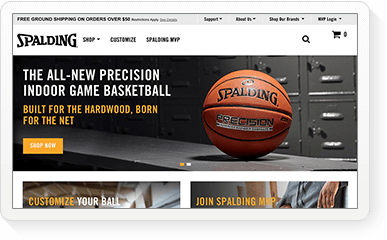 Our powerful online platform also allows you to create a seamless customer experience. Members can ask a question, file a service ticket, and make a purchase — all within the community. And you’ll have a 360-degree view of a customer’s entire journey. How is Community Cloud priced? Community Cloud is priced based on the type of community you’re building. Employee, Partner, and Customer communities each start with a base price, and can include additional savings based on the number of users and the needs of your growing business. Contact us at 1-800-667-6389 to speak with a Community Cloud representative who can help you find the right solution for your business. What is the difference between Employee, Customer, and Partner communities? Employee Community builds an internal social intranet across an enterprise. It includes Chatter, Sites, myCases, Answers, Files, Content Libraries, Knowledge, and Ideas. Externally facing Community Cloud products include Customer Community, Customer Plus Community, and Partner Community. Customer Community enables feed discussions, groups, profiles, gamification, moderation, analytics — everything you need for high-scale external collaboration. 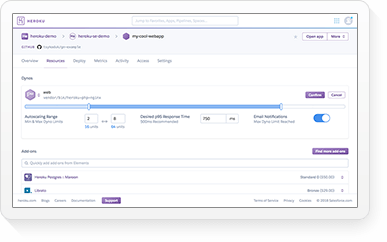 Customer Community Plus adds the ability to control sharing; add private groups; and limit the ability to access files, posts, and records within the community so that some conversations can happen in private. In addition to this privacy, Partner Community enables cooperative selling within the community, adding lead and opportunity management, campaigns, and events. How and when do I use Templates? Any business user can use templates to build a customized, branded community anytime, without coding or even IT staff. Templates are specifically designed to allow you to quickly and easily set up and maintain a community right out of the box. And they are automatically mobile optimized, so your community will always look great on any device. If you’d like to customize your community even more, Lightning Community builder allows you to change the look and feel of Templates. And of course, no coding is required. The Lightning Community Builder makes it easy for any business user — not just developers and IT staff — to quickly deploy a customized, branded and mobile-optimized community. 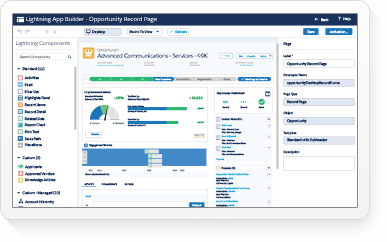 Visualforce code allows near-limitless customization of the community experience. It’s used as a framework that allows developers to build sophisticated custom user interfaces that can be hosted on the Force.com platform. 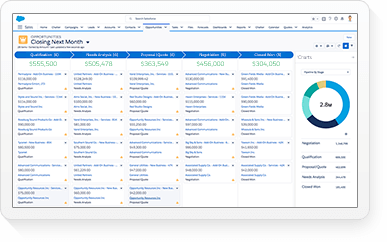 Salesforce partners are skilled at using Visualforce, and are ready work with you to create a community that matches your specialized business needs. What are some examples of customers that have implemented Community Cloud? Thousands of companies of every size have built communities with Community Cloud, and found new and exciting ways to connect with their customers, partners, and employees — and transform their business. These include Papa Murphy’s, Plus Relocation, Philips, Toyota, Virgin America Airlines, and more. Can I migrate my community from a different platform to Salesforce? Yes. 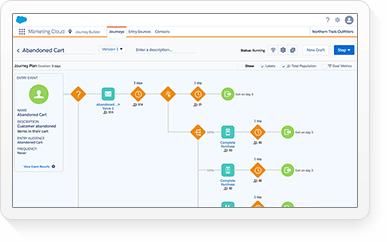 Salesforce can help you successfully deploy a community that is on a non-Salesforce portal, or even another community platform. We can also connect you with Salesforce partners who can help make the process easier.